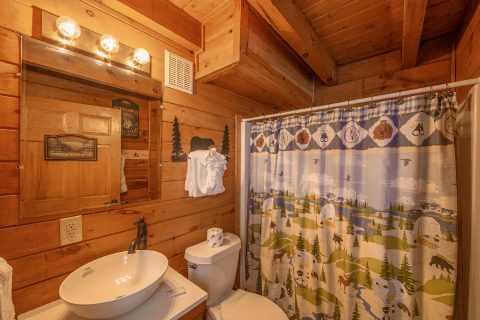 Update: This cabin is getting new upgrades, so stay tuned for new photos that will show these improvements! 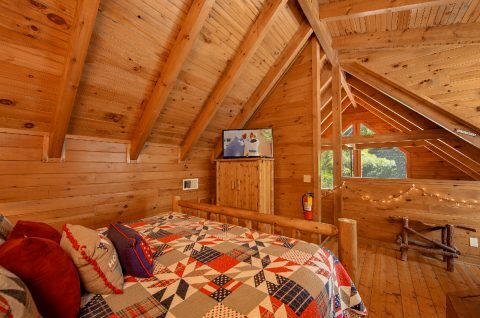 "Moose Lake Lodge," your answer to finding pet friendly lodging in Sevierville TN, offers in-cabin amenities for the whole family and a convenient location to all the action of the Smokies. 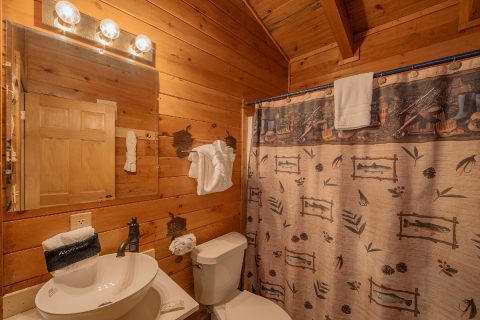 You're never too far from your pets in this 1-bedroom Smoky Mountains pet friendly cabin, and, with sleeping accommodations for up to 4 guests, serene cabin community, a level yard, and wide paved streets, this pet-friendly cabin in Sevierville gives the whole family a chance to enjoy the beauty and fun of the Smokies. 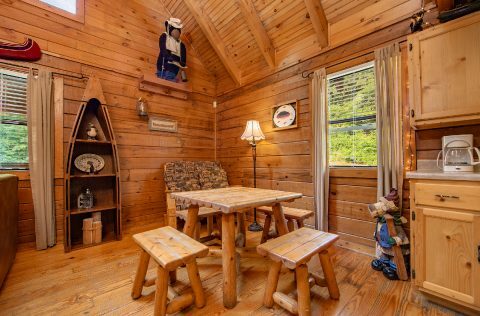 Take advantage of the easy access your pet friendly cabin in Pigeon Forge provides to nearby attractions, restaurants, and shopping outlets without ever being too far away to quickly check on their pets. Back at the resort, maybe you'd like to take a stroll around the large fishing pond with your pet or try your hand at catching a fish or two yourself in this catch and release pond. 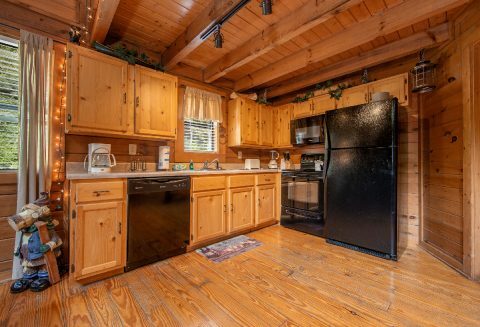 Evenings are a great time of the day for family members to gather on the cabin's large deck that overlooks the pond and enjoy dinner hot off the gas grill or from the cabin’s fully equipped kitchen. 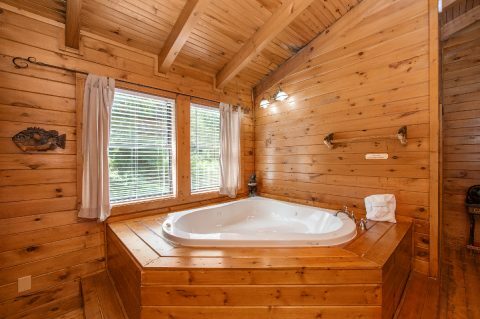 After dinner, relax in your year-round hot tub or play a few games of pool before unwinding by watching movies or television on the 50" TV. 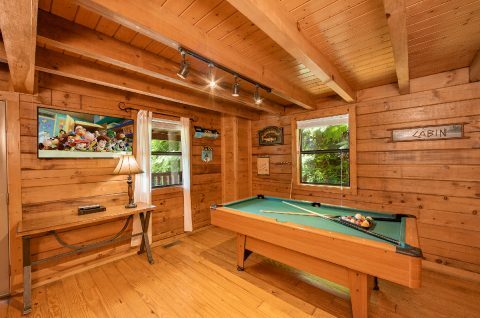 This cabin's game room also provides a television. 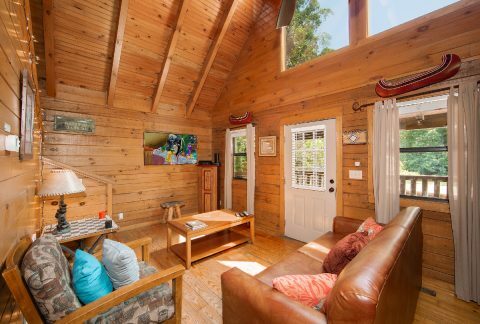 With your cabin's WiFi, you can easily share photos of your trip with friends and family back home! 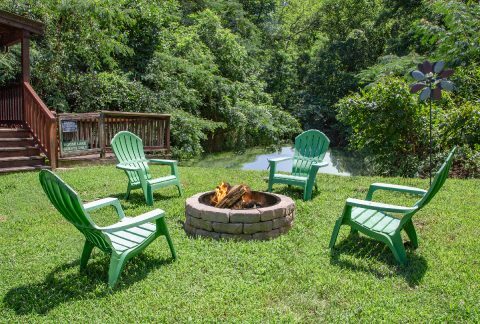 You'll also love using your cabin's outdoor fire pit while you enjoy a nice evening of star gazing by the fireside underneath a starry Smoky Mountain night's sky. 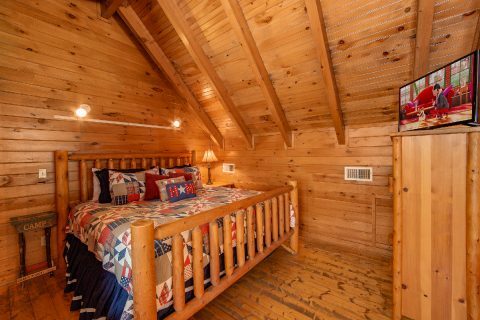 As evening comes to a close, you can retire to you pet-friendly cabin in Sevierville, TN's master suite that features a king-size, 4 post log bed, jacuzzi tub for two, and a personal television. 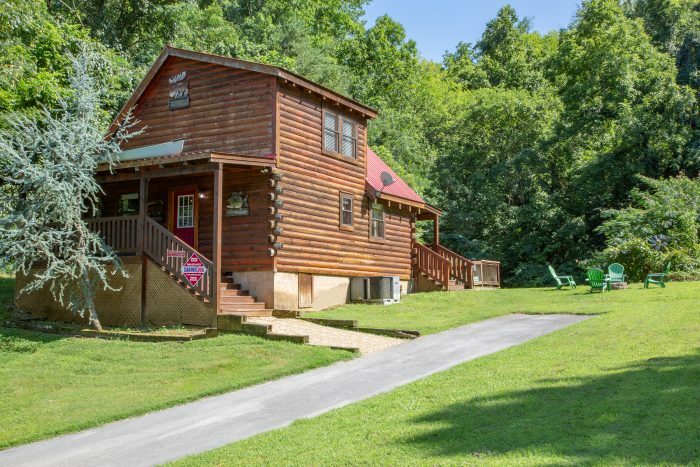 "Moose Lake Lodge" is the answer to your need for a pet friendly lodging in Sevierville TN and the perfect place for a small family to have an unforgettable Smoky Mountains vacation experience. Book "Moose Lake Lodge" or another pet friendly lodging in Sevierville, TN online for an immediate Online Cabin Discount!